With a beautiful coastline and a city full of culture Lisbon is quickly becoming a popular European hotspot. Read on to find why the Portuguese capital should be your next city break! 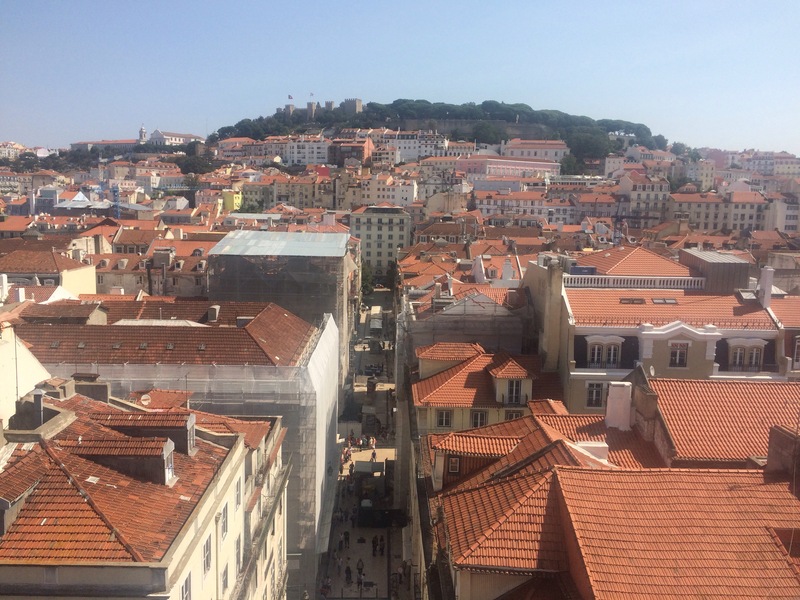 Earlier this year I had noticed that the Portuguese capital of Lisbon had appeared several times on various lists of “Places to visit in 2017” so decided it was a city that had to be explored and headed there for a short break. 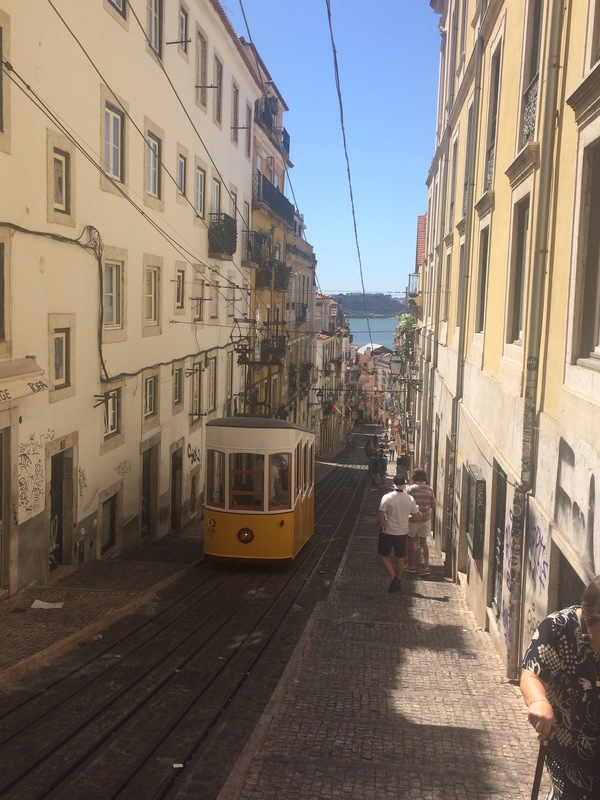 Lisbon is famous for being built on seven hills, with each one having their own story to tell and viewpoints which uncover the hidden corners of the city. So as you can imagine the landscape is far from flat meaning it can prove difficult to get around and climbing up and down those hills is certainly not for the faint-hearted! in any of the main stations for €0.50 and topped up as required. This card also allows the use of trams if you fancy something a little traditional. We mainly opted for the option of walking throughout the city which was a pleasant but often a very tiring way of taking in the city at our own pace. You will be sure to find hidden gems around every corner which you may never find unless you are walking. A free walking tour is an active and budget-friendly way to find out a little more about a new place upon arriving as it can help determine how you might spend the time you have in the city. There were various agencies offering similar tours, however, our tour was run by Sandmans and commenced in the central point of Praca Luis de Camoes. Our guide Rita took us to various locations of historical significance in the evolution of Lisbon and Portugal itself throughout the centuries – a country whose history I had little knowledge of prior to the tour. It really is a great way to find your bearings and get a glimpse of places slightly off the tourist trail, not forgetting some handy tips from a local themselves! Despite them being advertised as FREE, the tour guide will often mention giving a tip at the end of the tour if you were, of course, satisfied with your experience, so feel free to give as much or as little as you feel worth. If you have an active side to you, exploring the country along the stunning Atlantic coastline can be seen from the back of a bicycle. The city is not short of places to rent bikes, however, due to its recent positive reviews, we chose to go through the Lisbon Bike Rentals. The Monster Bike as it was known, is not the typical sort of bicycle you might usually try, as on first glance the huge tyres gave it a look of something very fierce and powerful. For a full 9 hours, we had access for €33 (as well as a fully refundable deposit which can be done by providing credit card details) giving us the chance to explore some slightly less crowded spots along the stretch of coast West of Lisbon centre in the direction of Cascais and beyond. Most of the coastal route was well designed for cyclists and our battery power assist allowed us to cover a round trip of almost 70km. There is, of course, the option to try the up and down route to explore the hills of Lisbon as the power assist makes the bike the perfect tool to tackle them if you are looking for a challenge in the mid-September heat. This picturesque town located in the foothills of the Sintra Mountains can be easily reached by a direct train of 40 minutes from the Rossio station. Due to its position standing 1,300 ft above sea level, it is not uncommon to see a layer of mist towards the direction of the Atlantic coast which gives an air of mystery. The attraction for many to Sintra is the National Palace, the construction of which was started in the 14th century and is certainly an impressive piece of architecture. Entry to the palace grounds is free on a Sunday however if you are visiting any other day of the week the typical price is around €8 to access the park and palace terraces, but it is possible to simply walk through the grounds and enjoy the scenery from above without paying anything. The hilly town is also lined with pretty side streets where you can find various eateries and some interesting vendors selling souvenirs or a handmade craft. After making the trip up and back down the hill to the National Palace, a drink of local Port in one of the squares whilst peacefully people watching was the perfect way to recharge. If you get the chance, a trip away from the hustle of a capital city to the coastal areas is worth it. Cascais is a coastal resort town just west of Lisbon and can be reached by a short train ride from the Cais do Sodré station. There are three main bays in the town all attracting both local and overseas tourists and we found that the weekends tend to be busier even in one of the slightly more secluded coves. There are also several beaches which you can choose to stop off at along the train route to Cascais, or if you prefer something more active there is the option to rent bikes in the town and travel further up the coast towards the Parque Natural de Sintra-Cascais. As we had already sampled the monster bikes, we opted for the slightly less strenuous route on foot, wandering around the cobbled streets then stopping off at one of the many beachside bars. Alfama is one of the oldest districts in Lisbon and is a great way to see a glimpse of the Portuguese past as you wander through the maze of narrow cobbled streets and beautifully tiled ancient buildings. In the past Alfama was known for being home to the poor and disadvantaged population of Lisbon but now it has a very different reputation. Around every corner or steep climb, we found something different whether it was a unique artisan shop or a quirky cafe, where we sampled our first Pastel de Nata – the egg custard tart pastry typical in Portugal which is a must try! As the sun sets over the city for another day, there are several viewpoints to look out over the city, one being Miradouro das Portas do Sol which is where our Sunday evening was spent listening to a lone busker amongst a very warm and laid back vibe. There are many attractions in the Alfama district which have an entry fee such as the castle and several museums however we prefer to veer away from the tourist trail and get lost for free in the maze of this charming district. Staying with locals is something I would highly recommend from our experience. The phenomenon is pretty big in Lisbon with so much choice in accommodation. We stayed in a beautiful apartment with four Portuguese nationals, located on Rua President Arriaga, just West of the centre but very easy to access by public transport and well under €5 for one way in an Uber from any central location (an app that was well used during our stay). 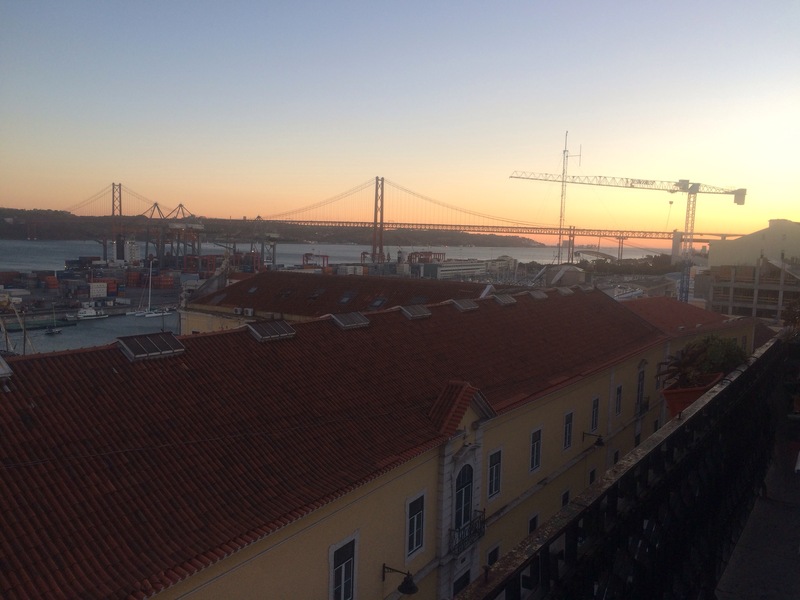 As the area is very close to the cargo shipping docks, this meant that we had the best views of the Ponte 25 de abril, which allowed for some great sunset and sunrise photography. The residents of the apartment were very welcoming and more than happy to give advice on what not to miss include some excellent foodie tips, which I shall share with you later. One of the specialities in Portugal is the pastel de nata, which is essentially the Portuguese version of an egg custard tart. They were in fact created before the 18th century by the Catholic monks of the Jerónimos Monastery in the civil parish of Santa Maria de Belém, in Lisbon, where the Pasteis de Belen bakery still stands as a popular tourist spot for trying out the sweet treat. There are however so many other places in the city where you can try the staple food of the sweet-toothed Portuguese. This was recommended by the Air BnB hosts so we knew it would not disappoint. The restaurant has a bohemian, bistro style ambience serving a mixture of Portuguese and Brazilian style dishes. We arrived around 1030pm on a Saturday evening and still had to wait in the street whilst a table became vacant, (which shows the popularity of this place), however, we were able to order drinks and enjoy the weekend vibe in the Barrio Alto part of Lisbon.The main menu changes daily and includes three dishes based on either a meat, fish and vegetarian option so there is something for everyone. The starters are great to nibble on whilst waiting for the main meals and are around €5-€10 depending on what you choose. This was certainly a restaurant offering amazing value for money, with the bill coming to around €30 per person for three courses and plenty of wine. A culinary experience not to miss! We found this one by accident as we were actually on route to another restaurant, which looked less appealing so we stumbled upon this great eatery, located at the top of some steep hills on the corner of two streets. There is plenty of choice when it comes to the burgers, both meat and vegetarian options. The restaurant is one of several in the city but has taken the simple idea of a burger and fries, turning it into an exciting tasting experience. included carrot soup, a veggie burger patty with a colourful salad and a speciality ginger tea. Another great vegan-friendly, organic option is situated in a building full of character. On first impressions, it might not look like the most glamorous place to eat, but the place is full of locals which creates a good feeling about the food. The entrance floor is small and crowded, but if you head upstairs you enter a more relaxed atmosphere where you choose a spot and sit cross-legged at a low table or on one of the many floor cushions. There is a selection of plates depending on your level of hunger, the most expensive being a bargain €7 for four main dishes such as seitan, black bean stew, mixed vegetables or couscous and several side salad options. atmosphere. The main menu isn’t too complicated but incorporates various fish dishes so it’s easy to try the sardine speciality of Lisbon! The staff are so welcoming and helpful, advising on the most suitable wine, and just before closing too. This allowed us to satisfy our sweet tooth, as we tucked into a carrot cake and fruit combination, and a divine strawberry and basil cheesecake with white chocolate ice-cream, the delicious combination that we had previously tried and loved! beer Super Bock. Dishes are not labelled so it is very much a guessing game of choosing something from the buffet selection that takes your fancy. The food ranges from salad options to stew style dishes along with a range of small appetiser bites, all of which are based on veganism and is a perfect way of refuelling after exploring the Seven Hills of Lisbon. Have you visited or have plans to visit the Portuguese capital? Are there any other recommendations that we missed? We would love to hear your thoughts & experiences! Feel free to let me know what you thought of this article, I always love feedback and finding ways how to improve my writing!